As wavies and curlies, we tend to play the game of keeping hair clumps out of the drain on wash day. Why does curly hair shed "more"? Since we don’t brush our hair daily, many hair strands that fall out naturally throughout the day get caught up in other curls and therefore, it does not come out until it is time to wash and detangle. This is because the average person loses between 50-100 strands a day so if you don’t wash or brush until 3rd day hair you may be getting rid of around 300 strands! According to the American Academy of Dermatology, this is what is known as hair shedding. While some hair shedding should not be cause for concern, there can be a time when looking down at your drain becomes worrisome. There are different factors in life that can cause what is known as excessive shedding. First, know the difference between this and hair loss. 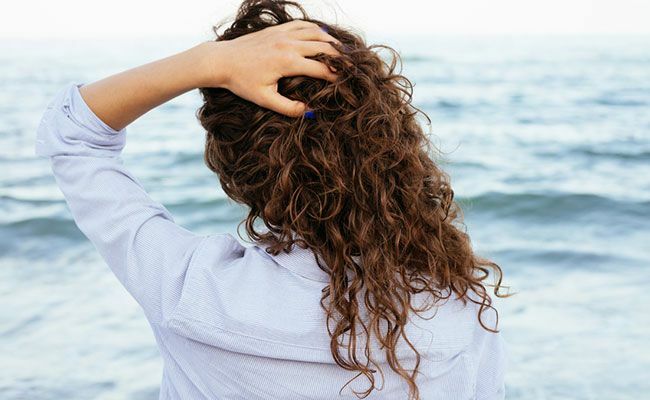 What's the difference between hair shedding and hair loss? Hair shedding is a normal body function where some of the hair strands fall out to make room for new hair growth, you can lose between 50 to 100 strands a day--and sometimes even up to 150--and this is still considered normal, according to WebMD. You will grow back new hair to take the place of the hair that you are shedding. Hair shedding can also be seasonal, meaning you lose less hair in the summer months and start losing more hair in the fall and winter months. One common cause of excessive shedding is childbirth. Many mothers lose hair after giving birth, but not to fear as this pattern usually only lasts for a few months and then reverts to its normal rate. Other causes of excessive shedding are quick weight loss, stress, sickness or surgery, in which case it is best to see your doctor. Hair loss is when the fallen hair fails to grow back. If you have hair loss you will start to notice either a bald spot or the look of your hair actually thinning as no new hair is growing in to replace the hair that you are losing. Hair loss can vary, some may lose hair gradually and slowly start to notice thinning at the top, while others may actually experience clumps of hair falling out. Hair loss can be caused by factors such as a poor diet, tight hair styles, stress, genetics, or a combination of these things. The good news: most hair loss issues can be treated. Consult with your medical doctor for professional advice. While there is no way to prevent normal hair shedding, there are ways to improve our hair's health and further prevent true hair loss by caring for ourselves from the inside out--this includes making sure our diet contains enough protein and iron, in addition to making sure we thoroughly cleanse the scalp on wash day. Also, don't forget to be gentle when creating a braided hairstyle or updo. Now you can wash your hair in peace knowing that although your hair shedding may clog your drain, it’s probably nothing more than your body making room for even more hair. If your hair loss exceeds the normal patterns that we have described here, be sure to seek the advice of a doctor to determine the cause and best course of treatment. Follow us on Instagram @NaturallyCurly & my personal page, @ThePolishedCurl for more wavy + curly hair advice!